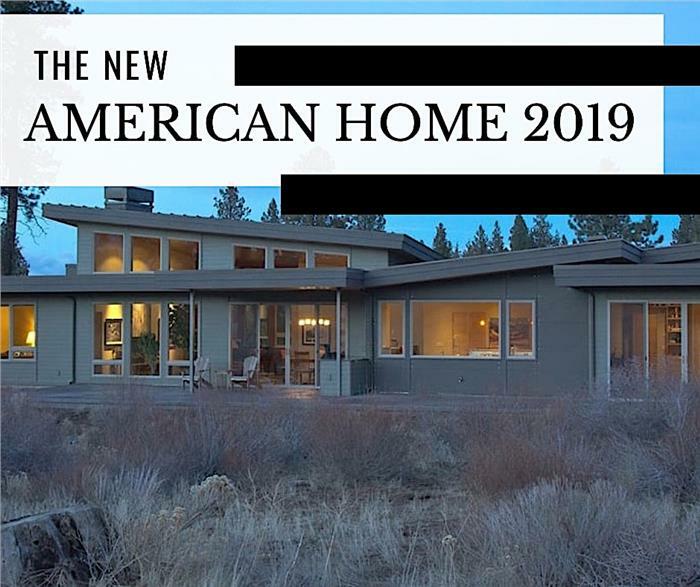 February can't come soon enough for the thousands of professional builders, architects, and designers who are awaiting the unveiling of The New American Home (TNAH) 2019 at the annual International Builders’ Show (IBS) in Las Vegas. The highlight of the show, TNAH is conceived as “both a show house and a for-sale product, balancing architectural design creativity and the bottom line.” Each year’s edition features state-of-the-art technology, unique elements and finishes – and embodies high levels of energy-efficiency, safety, sustainability, and aesthetics. 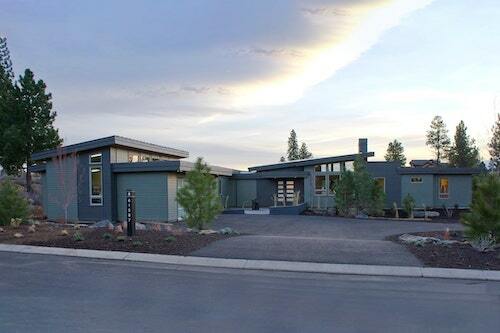 Just as impressive as the previous versions, many of which were based on Modern house plans, the $4.9 million TNAH 2019 is a single-level desert contemporary structure with Mid-Century Modern touches. Situated on a linear lot in Ascaya, a luxury community in Henderson that is high on the hills of the scenic McCullough Range, the home is spread over 7,900 square feet of living space. It comes with five bedrooms, five baths, indoor-outdoor living features at the front of the home, an infinity-edge pool, a Jacuzzi, a spa, a “show” garage, an outdoor heating area – and best of all, dramatic views of the Las Vegas skyline and the Red Rock Canyons. Similar in architectural design style to TNAH, this 3-bedroom, 3.5-bath, 1-story home (top) shares other features, such as lots of glass and a floor plan that incorporates indoors and outdoors in living space, with its large entry courtyard and partially covered, almost-full-width rear terrace, bottom (Plan #202-1020). With the annual IBS rotating between Orlando and Las Vegas every three years, the National Association of Home Builders (NAHB) began the builder/designer selection and review process a few years ago. Sun West Custom Homes of Las Vegas won the contract with its pitch for a spacious, state-of-the-art home with breathtaking views. Ascaya (which means “chiseled rock” in Chinese) was chosen as the location for TNAH 2019 because it has the highest elevation in the city. The site was ideal in that each of the 313 lots in the affluent development is carved into the mountain, and all have gorgeous views. According to Dan Coletti, president of Sun West, he had three goals for The New American Home: unique design, cool views, and optimized energy efficiency. He noted that the home would showcase never-before-seen architecture that goes beyond the typical definitions of open concept and outdoor living. Here are the top 5 themes to look for when the TNAH 2019 is finally unveiled to the public in February 2019. In keeping with the Mid-century Modern vibe, Coletti and Sun West created an open concept home with a single-sloped roof over the sprawling one-story structure, high ceilings, minimalist modern fixtures, lots of glass, and a seamless blend of the indoor-outdoor living spaces. The master suite – along with the Great Room, kitchen, and spa – were strategically positioned in the rear section of TNAH to take advantage of the Las Vegas Strip vista. The master suite is flanked by an indoor-outdoor wet bar and a formal dining room. And all around the house are outdoor living areas with a number of fire pits. One of the stated goals of the project team of TNAH 2019 is to achieve a Home Energy Rating System (HERS) rating below 50 and net-zero with solar panels. 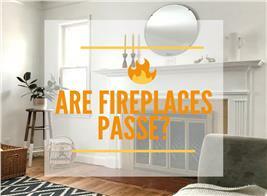 The average new home, according to the U.S. Department of Energy, scores a HERS of 100. And early evaluations of the home’s performance point to an “extremely air tight” structure that is on track to be among the most energy efficient in the program’s history. The Sun West team fashioned a roof that follows the curve of the lot – starting with the roof that shades the outdoor living space. A number of square forms used for several spaces are angled 90 degrees to draw interest, create more usable space, and capture views. 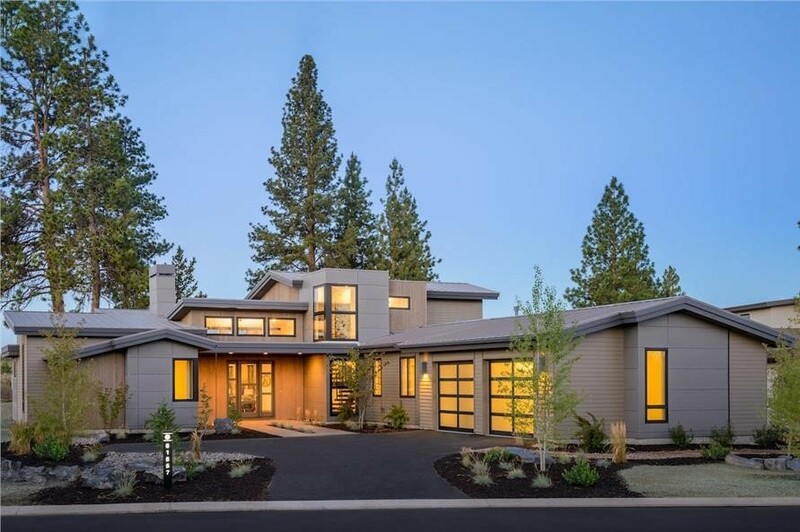 Much like TNAH 2019 – with exception of the single-sloped rooflines – this 3,217-sq.-ft. Northwest Contemporary style home highlights clean roof lines, lots of glass, and a covered outdoor living area where the family can enjoy the sun and the surrounding landscape (Plan #202-1021). 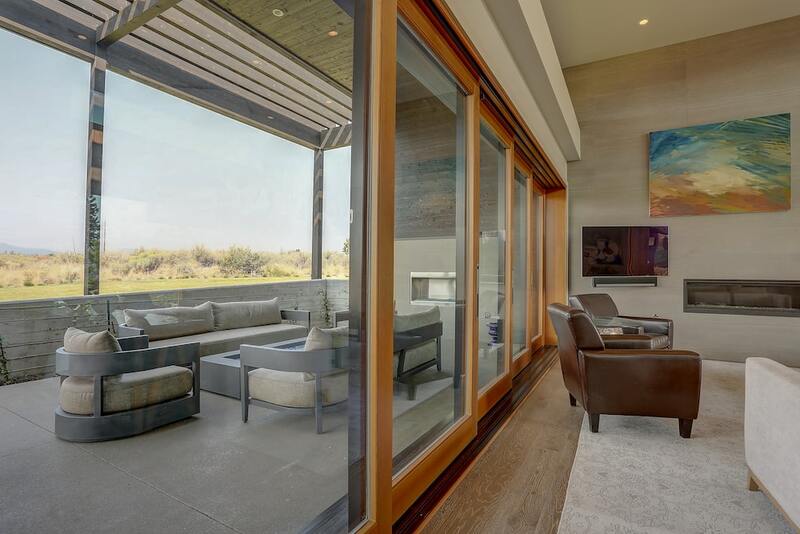 True to the claim that TNAH 2019 would feature “never-before-seen architecture” that goes beyond the typical open concept and outdoor living designs, the Sun West team added some very intriguing elements to the home. As you step into the property, the first sight is the courtyard – a very attractively landscaped and wide, covered space. It is highlighted by a huge stone slab described as a “limestone explosion” that looks as though it fell through the roof. As in most of the rooms of TNAH, there are floor-to-ceiling glass doors that allow abundant light into the home. The courtyard provides access into the house through the study on one side and the “show” garage on the other side. 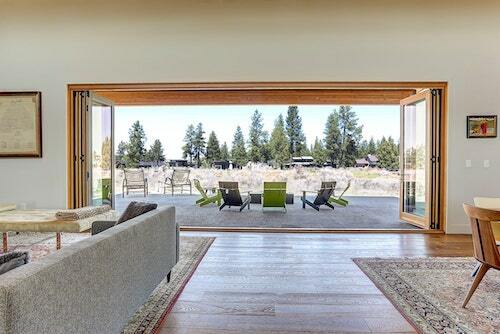 According to Professional Builder, the innovative TNAH 2019 also showcases two “20-foot-wide telescoping patio doors that pocket into the walls to create wide-open avenues … to the outdoor living space.” The door structure is a “combination of an under-slab grade beam, a double-glulam header with plywood stiffeners, and a steel box moment frame supporting a five-panel, aluminum-frame, telescoping and pocketed patio door.” The concrete grade beam carries the vast majority of the door’s total load of about 1,000 pounds, while the header and moment frame resist lateral wind forces to help ensure consistently smooth operation anywhere along the door’s 20-foot track. Top: This stacked sliding patio door in a 3-bedroom, 3.5-bath Modern style home is very similar to the one used in TNAH 2019 (Plan #202-1027). 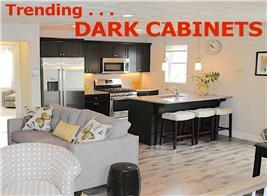 Bottom: Another home shows the spectacular effect of open stacked doors (Plan #202-1013). Walk into the courtyard of The New American Home and look up, and you'll see the wood ceiling (made of 1x6 Ponderosa pine) that extends to the Great Room and the back patio – a seamless flow that brings the indoor-outdoor feel full circle. 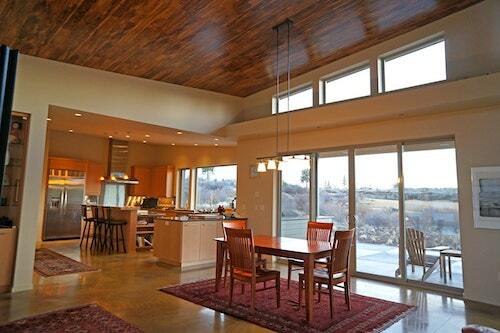 Thanks to the wood-plank ceiling, the luxurious home remains warm and comfortable. The high wooden plank ceiling of this 3-bedroom, 3.5-bath Midcentury Modern home and the sliders looking out on a wide terrace and extended vista are very reminiscent of TNAH 2019 (Plan #202-1020). Definitely a fascinating feature of the home is the man cave/showroom garage. When one approaches from the courtyard – to the right side – the glass-enclosed cars will be in full view. For car enthusiasts or collectors of vintage cars, this garage is a perfect feature of TNAH 2019. Not only does the space function as a showroom garage, it is also designed as a man cave – with a well-equipped, air-conditioned game room. 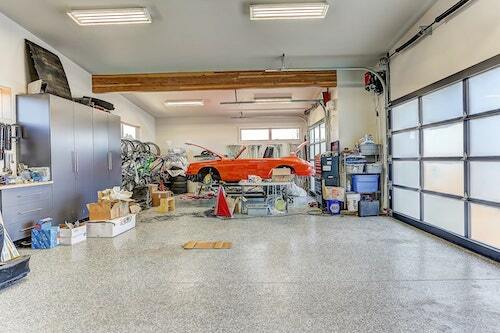 Not quite the "show" garage of TNAH 2019, which has a conditioned game room, this garage in a Mid-century Modern home is simiar – down to the garage doors themselves – to the TNAH and has its own "show" qualities (Plan #202-1013). 5. Spectacular Views, Of Course! Why else would the design team choose the one site in Las Vegas with the highest elevation if not to highlight the ultimate cool views of the Las Vegas Valley and the mountains? 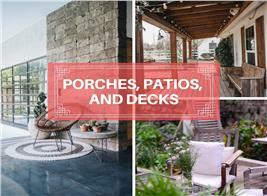 As February looms ahead, and architects, builders, and designers prepare for another International Builders’ Show in Las Vegas, get set for the big reveal of The New American Home 2019 – and all the hot trends of the year!